"...This book should be required reading in every school and for every wildlife manager in bear country. I, for one, will definitely be keeping my trash cans locked and my bird feeders put away. I highly recommend Living With Bears Handbook to any wildlife manager or conservation staff member working in bear country as a useful reference tool for explaining bear interactions to the public." "Despite the increase in human-bear interactions across North America, Linda's book remains the only book available that provides a single source of information about the basics of bear biology and behavior, bear management, and implementing solutions to prevent conflicts. This expanded 2nd edition will be an asset in our toolbox for educating the public on how they can be partners in preventing and resolving bear conflicts." "Make room on the top of your stack for this reorganized and completely updated handbook. It's my go-to definitive resource on bears." "The best single source of information and inspiration on how to understand and live compatibly with bears. Masterson writes with understanding, authority and wit, and shares in her encyclopedic knowledge of bears and how to reduce human-bear conflicts." "I couldn't ask for a better reference. Living With Bears Handbook covers everything people need to know in an interesting, motivating, easy-to-understand way; I recommend it to anyone who lives and recreates in bear country and to those who need a tool to reach them." "A requisite for anyone living or recreating in bear habitat, and an exceptional resource for those of us who work with bears professionally that knowledgeably addresses both the issues and the solutions. Now if people will just emulate what Linda is teaching, our world will be much happier for humans and bears alike." "A copy of this book should be in the door pocket of every agency official who deals with human/bear conflicts and gives a damn about bears." "An excellent job of presenting a great deal of valuable information that promotes coexistence. I highly recommend it to everyone living in bear country, and wildlife managers who deal with human-bear conflicts." "Bravo! This go-to handbook pulls together a comprehensive collection of facts and practical advice on living with bears. A fun and insightful read." "As the author so clearly points out, one cannot solve this problem alone. It takes the whole community. I still stand by my advice from the first edition: Buy two copies—one to wear out at home and one to loan to neighbors." "A comprehensive primer that is useful for professionals and the public alike. I found the book highly readable, clear, easy to use and quite complete. Masterson strikes a good balance between information and entertainment, producing a book I suspect biologists, wildlife managers and agency personnel will turn to more than they might at first think." "Living With Bears Handbook empowers me to do everything I can to help keep bears wild, and hopefully save a bear's life. I will definitely use these tips, resources, and easy-to-understand steps to avoid conflicts with bears at our home and when we hike the Rockies." "All wildlife photographers know the best way to create great photos is to understand their subject. And if you photograph bears you MUST read Linda Masterson's amazing Living With Bears Handbook. You will not only learn bear behavior, which will allow you to capture better images, you will have less impact on the bears in the process because you will truly understand them." "As a long-time beekeeper, I can say, without a doubt, that Living with Bears Handbook is a must-read for all beekeepers in bear country. It's chock full of handy tips that will help beekeepers protect their hives, including ways to create physical barriers that keep hungry and curious bears at bay." "I have over 350 bear publications in my personal library and I must say that this is one of my favorites. 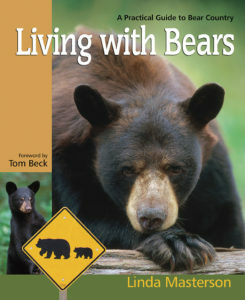 A wonderful, well written book, full of useful information on how to live with bears. I especially liked the tips spread throughout the book by noted bear biologist Tom Beck." "This is not your usual dry documentary type book on an animal. It's very lively, funny, yet serious at the same time. After all, dealing with bears is serious business. If you live in bear country, this is a must have book. You'll learn to respect bears and not be afraid of them It's intetersting to learn that bears are more afraid of us than we are of them." — Cliff W. Allen, Jr.
"Each year thousands of bears are destroyed in North America largely because of our carelessness. Use this excellent book and you can help ensure the bear has a wild future in our increasingly human-dominated world." "A remarkable book that will change the way you think and act in bear country. Masterson is a master writer and researcher. Her book should be on the shelves of every library and in every home by which a bear has ever strolled." "An excellent source of information for the general public and management biologists on the biology of bears, the underlying causes of human-bear conflicts and methods for reducing conflicts where people live, work and recreate in bear habitats. I heartily recommend it." "Easy to understand, fun to read, and full of case histories that present practical solutions to a variety of real-life human-bear conflicts. As a conflict resolution specialist, I'll refer many people to Living with Bears Handbook." "Great job delivering badly needed information! 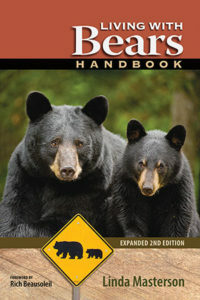 This highly readable handbook is a valuable resource to anyone trying to understand or manage human-bear conflicts." "This handbook is the definitive resource I refer to when training volunteers or presenting to the public. It provides all the tools necessary for people living and recreating in bear country to share habitat with our wild neighbors." "An excellent book with so much great information that we want to pass on to our Hemlock Farms residents. With minor adjustments in our behavior, we can make major changes in bear behavior." "We recommend Living with Bears to all our property owners, and we sell it in the office. It makes it much easier to get people to understand what they need to do to prevent bear problems." "If you live in bear country (and, unless you're an inner-city resident, you probably do), you owe it to bears to read this smart, useful and long-overdue book. Don't let them die because of your or your neighbors' mistakes." "A must-read for urban wildlife specialists, community leaders and homeowners looking to protect their property from ursine neighbors. Masterson uses wit and a wealth of wisdom to convince readers that most human/bear conflicts come when a bear's unending search for food is easily satisfied when humans unknowingly serve it up on a silver platter in easily accessible garbage cans, bird feeders, camp coolers, orchards and gardens." "Linda Masterson has put together a book that is concise, knowledgeable and easy-to-read. And her timing is perfect. This book is a godsend to those attempting to demonstrate to the 'smarter of the two species' the need and ability to live with bears."